BUILT AT BELFAST and fitted out in Holland, the Statendam has a gross tonnage of 28,291. Her length is 674 ft 3 in, her beam 81 ft 4 in and her depth 49 ft 5 in. She is propelled by twin screws operated by geared turbines taking steam from water tube boilers. She carries 1,670 passengers in addition to a crew of 600. Her speed is 19 knots. TIDY towns, clean beautiful meadows, spotless kitchens - all are justly attributed to the people of the Netherlands. So it is with their ships. The splendid Statendam, flagship of the Holland-America Line, ranks as a fitting representative of folk who have won their homes and livelihood from the sea on which their forebears sailed for many generations. The Statendam, built in 1929, is the third ship to bear the name. The first was a comparatively small ship of 10,000 tons built for the Holland-America Line. When the second Statendam was nearing completion in 1914 at the Belfast yard of Harland and Wolff, Ltd., the ship was taken over by the Allies as a transport and named Justicia. She did fine service and shipped thousands of American troops to France. In the summer of 1918, when in convoy off the Irish coast, she was attacked by a German submarine and was struck by two torpedoes - one in the engine-room, one in the forward boiler-room. The ship did not sink. She maintained her trim but settled a bit lower in the water. Attendant tugs took her in charge and set course for Lough Swilly. The attacker had escaped, but on the following day another submarine, UB 124, motored right in between the screening warships and torpedoed the Justicia twice amidships. Even British shipbuilding was not proof against four torpedoes, and the stricken vessel sank by the stern. For hours on end the destroyers hunted UB 124 and at last they succeeded in getting her. With the grim happenings of war left behind, the Holland-America Line turned its attention to the third and greatest Statendam of all. Again the Belfast yards were entrusted with her building, and when Harland and Wolff had safely launched the great ship she was towed by twelve large tugs to the Wilton Shipyards at Rotterdam for fitting out. The Statendam is 674 ft 3-in long, with a beam of 81 ft 4-in and an overhanging top deck that gives an extreme breadth of 84 feet. Her displacement tonnage is 38,900 and her gross tonnage 28,291. Her passenger capacity is 1,670. She has a crew of 600. The ship is propelled by twin screws operated by geared turbines taking steam from water tube boilers. Diesel engines drive the auxiliary generators supplying electricity. Careful consideration has been given in the Statendam to the problems of lighting and ventilation. The electric generating installation supplies current to some 9,000 lights in addition to electric motors and heaters, and in the ship there are about 2,000,000 feet of electric cable. rooms measure 27 feet by 17 feet and each of them has five windows. It is said that, for her size, the Statendam is provided with more windows than any other ship afloat. In the superstructure the circular port-holes have given place to square and rectangular windows. There are sixty-four windows in the main dining saloon alone. The technical details of this ship’s design and appointments are, however, overshadowed, in the opinion of most travellers, by the magnificence of her interior decorations. Since the Middle Ages Dutch interiors have held high positions in art and painting, and the Statendam’s public rooms typify the best that decorative skill can produce. Right forward, extending the whole width of the ship and surmounted only by the navigating bridge and the chart-room, is the Palm Court. Beneath a great domed ceiling, the Palm Court commands an uninterrupted view of the sea through large, square windows that almost cover the forward end and the sides. The style of decoration adopted for this room is Chinese, with red lacquer predominating. The floor is tiled with rubber and covered with beautiful Chinese rugs. The furnishings include chairs and settees with little tables placed conveniently here and there for the refreshment necessary to the proper contemplation of an unlimited expanse of salt water. Abaft the Palm Court the traveller finds the boat deck, flanked by the great lifeboats, and providing facilities for the ever-popular deck sports. Below is the promenade deck, enclosed by glass screens for the greater part of its length. Here is found the library, a distinguished room panelled in walnut and equipped with writing tables and deep easy chairs. A CABIN-CLASS STATEROOM in the Statendam. The best staterooms measure 27 feet by 17 feet, and each of them has five windows. It is claimed that, for her size, the Statendam has more windows than any other ship afloat. In the superstructure, windows have replaced the circular port-holes formerly universal in passenger ships The staterooms are fitted with well-sprung beds instead of berths, and have hot and cold running water laid on. On the promenade deck too is the great lounge, domed over in the centre with multi-coloured glass. Panels of carved oak extend from floor to ceiling. The room is magnificently set off by three Gobelin tapestries depicting quaint old Dutch landscapes. It is in this room that most of the social life of the ship is centred. and numerous staircases are also provided. The main stairway leads down to a spacious entrance hall, splendidly decorated and lined with marble. The most spacious room in the Statendam is the magnificent dining saloon, which occupies the entire middle portion of the ship on the third deck, or C Deck. This saloon is decorated and furnished in the Louis XVI style and during the day it is sunlit through large oval sidelights. At night an ingenious system of lighting concealed behind coloured glass throws a glow of light over the whole scene. Two fine oil paintings, representing “The Material and Spiritual Harvests of Mankind”, by a famous Dutch artist, the late W. L. Bruckman, comprise the principal decorations of the dining saloon. There are, in addition, a number of small oil murals which, with the ceiling paintings, were carried out by another Dutch artist, H. van der Velde. The swimming pool is one feature that now seems to be essential in a modern liner. The pool in the Statendam is situated on F Deck and has been made the subject of a magnificent display of tiling. The colouring is blue and the tiles are of the world-famous Delft ware. Flanked by pillars within a tiled balustrade, the pool makes a splendid picture in the golden glow of cleverly designed lighting. Adjoining the swimming pool are the gymnasium, with its multiplicity of machines and devices for the energetic, and the Turkish baths. 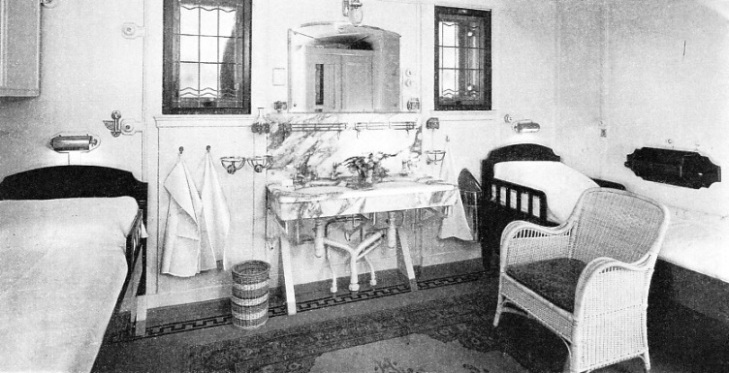 The passenger accommodation is in keeping with the public rooms, with well-sprung beds, hot and cold water in the commodious staterooms, and the attendance of well-trained stewards. It is not merely in her cabin-class appointments that the Statendam has attained to a high standard of comfort, for the tourist-class passenger also is well catered for. Here, again, are beds, and hot and cold water in the staterooms. The tourist dining saloon extends the full width of the ship and is decorated in a modernistic style with polished mahogany. Large double doors open from the dining saloon into the tourist lounge. The decorative scheme of the saloon blends with that of the lounge. The tourist smoking room on B Deck leads out on to a promenade and to a spacious games area extending the entire width of the ship. On A Deck is the tourist veranda cafe, fitted with large sliding windows that provide a clear view on three sides. The decorations of the cafe, in light-coloured lacquer, are brightened by banks of flowers and plants. Forward of the veranda cafe is another large deck space similar to that on B Deck. The principal service of the Statendam, as the name of her owners suggests, is between Holland and America. She sails from Rotterdam, and usually calls at Boulogne and Southampton on her way to New York. The Statendam was scheduled to begin her maiden voyage on April 11, 1929, and her arrival in New York coincided with the three hundredth anniversary of the arrival of the first Dutch ship in America. It was Henry Hudson’s Half Moon (D’Halve Maen) sailing into the same waters that led to the first settlement on the site of what is now New York City. It is not merely on the Atlantic service, however, that the Statendam has made her reputation. Many a fine cruise in historic Waters stands to her credit. Holland-America Line cruises generally start from New York and afford dwellers in that city an opportunity to escape for a few days from the rigours of winter. The West Indies, South America and Bermuda are all within easy steaming of New York. The Mediterranean cruises, however, offer the greatest variety of scene. The ship, having left New York on a bitterly cold afternoon early in February, steams steadily east for seven days to Funchal, Madeira. Two days later the ship reaches the gateway of the Mediterranean, the Rock of Gibraltar, with its mighty fortress and gun galleries. Tangier in Morocco provides another opportunity to land and see at first hand the motley crowds that throng this North African port. Algiers, capital of Algeria, is reached under a blazing sun, just a fortnight after the ship has left wintry New York. Another two days and the steamer anchors off Monaco. The next stay is at Malta. The Statendam now skirts the coast of Asia Minor, bound for Beirut, the chief city of Syria, set among the cedars of Lebanon from which Solomon took timbers for his Temple. The steamer enters St. George’s Bay - legendary setting of the struggle between St. George and the Dragon. Haifa, the modern port of Jerusalem, is the next call and here three days are spent to allow for a journey to the Holy City. Next the ship sails to the cradle of civilization - Egypt, mysterious land of the Pharaohs with a story that goes back for thousands of years. As the ship anchors at Port Said a perfect view of the wonderful Suez Canal is afforded. A few hours’ journey takes passengers to Cairo. Not far distant is Alexandria, where Hero the Greek discovered the principle on which work the great steam turbines that drive the Statendam. After nearly a week in Egyptian waters the Statendam steams northwest to the famous island of Rhodes, passing Crete, with the towering peak of Mount Ida. Next the liner steams through the Dardanelles, past Gallipoli, to the ancient city of the Emperor Constantine - Istanbul. After a few hours in Istanbul, she steams through the Bosporus to within sight of the Black Sea and then returns. Athens is the next port of call. Then the ship steams along the coast of Illyria, where sailed Ulysses, to Corfu, a wonderful haven of natural beauty. At Kotor, once called Cattaro, on the Adriatic, the coast-line is wonderfully indented. For eighteen miles the Statendam steams inland from the Adriatic as the channel winds its way among towering mountain peaks and scenery of unsurpassed loveliness. Along the Dalmatian coast the voyage continues to Dubrovnik, once known as Ragusa, and then, after a brief stay, to Venice. From Venice the return voyage is made down the Adriatic, round the “heel” of Italy, to anchor in the busy harbour of Messina, scene of the great earthquake of December 1908. Early on a March morning the Statendam anchors in one of the most famous roadsteads in the world, the Bay of Naples. Cannes is the last call in the Mediterranean, and after having called at Southampton to disembark passengers for London, the Statendam steams on to her home port of Rotterdam. One week later the travellers arrive in New York, exactly two months after having set out on the long journey to the show -places of the Old World. 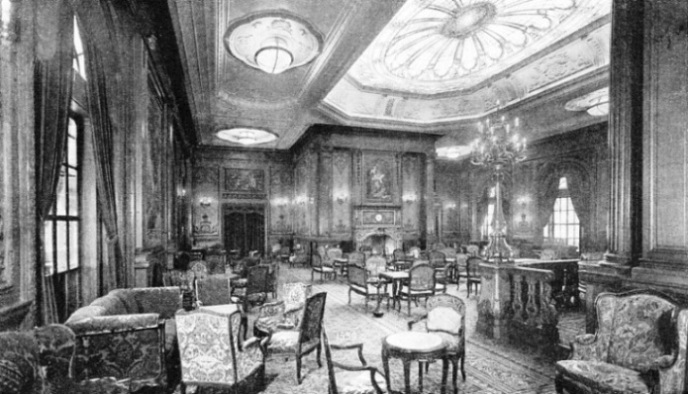 THE LOUNGE ON THE PROMENADE DECK. In this magnificent apartment most of the social life of the ship is centred. The skylight, with its multi-coloured glass, is particularly attractive. So, too, are the oak-panelled walls, which are embellished with carvings and tapestries. The furniture is mainly in the style of Louis XV. The large draped windows emphasize the note of spaciousness which is characteristic of the whole ship.